A striking addition to any table, this cake stand-crafted from gorgeous green flint glass-is perfect for displaying cupcakes and other tasty treats. Mosser Glass blends new designs with timeless classics for pieces that add a touch of sophistication to any setting. Within the Continental United States ONLY. Replacements are sent out upon receipt of damaged product. No used merchandise will be accepted. Acceptance of merchandise is final only after inspection. Return processing time generally takes a few weeks. All items are IN STOCK at time of listing. Inventory changes constantly and it is impossible to maintain perfectly accurate count of all items. You must contact me to process the return with the supplier. We are a small, family business. We promise we can make you happy if you give just us a fair chance. PLEASE CHECK OUT OUR OTHER ITEMS LISTED. 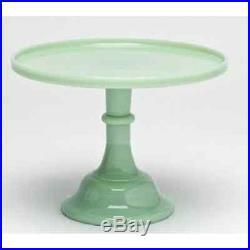 Jadeite/Jadite Green 12 Pedestal Cake Stand Plate Mosser 24012J" is in sale since Monday, March 18, 2019. This item is in the category "Pottery & Glass\Glass\Glassware\Contemporary Glass\Mosser". The seller is "coviper69" and is located in United States. This item can be shipped to United States, Canada, United Kingdom, Denmark, Romania, Slovakia, Bulgaria, Czech republic, Finland, Hungary, Latvia, Lithuania, Malta, Estonia, Australia, Greece, Portugal, Cyprus, Slovenia, Japan, China, Sweden, South Korea, Indonesia, Taiwan, South africa, Thailand, Belgium, France, Hong Kong, Ireland, Netherlands, Poland, Spain, Italy, Germany, Austria, Bahamas, Israel, Mexico, New Zealand, Philippines, Singapore, Switzerland, Norway, Saudi arabia, Ukraine, United arab emirates, Qatar, Kuwait, Bahrain, Croatia, Malaysia, Brazil, Chile, Colombia, Costa rica, Dominican republic, Panama, Trinidad and tobago, Guatemala, El salvador, Honduras, Jamaica, Antigua and barbuda, Aruba, Belize, Dominica, Grenada, Saint kitts and nevis, Saint lucia, Montserrat, Turks and caicos islands, Barbados, Bangladesh, Bermuda, Brunei darussalam, Bolivia, Ecuador, Egypt, French guiana, Guernsey, Gibraltar, Guadeloupe, Iceland, Jersey, Jordan, Cambodia, Cayman islands, Liechtenstein, Sri lanka, Luxembourg, Monaco, Macao, Martinique, Maldives, Nicaragua, Oman, Peru, Pakistan, Paraguay, Reunion, Viet nam, Uruguay.